Elon Musk is being sued by Vern Unsworth after an angry twitter response. 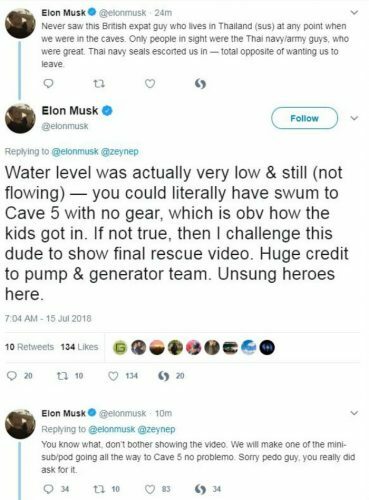 Elon Musk is being used after a series of offensive tweets towards Vern Unsworth, a British caver who helped in the rescue of junior football team who were trapped in a cave following a monsoon flooding in 2018. The incident between Mr. Musk and Mr. Unsworth took place during the attempt to rescue a junior football team and their coach from the Tham Luang Cave where Mr. Unsworth was drafted in due to his experience with caving and helped recruit other cave divers who were a vital part of the rescue operation. During this time, Elon Musk sent a group of Tesla engineers to the cave rescue to make a specially designed mini-submarine that Mr. Musk claimed could help free the junior football team from the caves. After Mr. Unsworth told CNN that he believe Mr. Musks submarine was a "PR stunt," Musk took to social media, giving more details on how this submarine would work and calling Mr. Unsworth a "pedo guy." Even though Elon Musk has apologised for his actions, stating "his actions against me do not justify my actions against him," Mr. Unsworth is believed to still be considering legal actions. In a series of "off the record" emails to Buzzfeed Journalists, Mr. Musk used several other insults as well as alleging that Mr. Unsworth had a "child bride." Elon Musk as said that he wishes for the California court to through out the defamation case, claiming that the comments we're "non-actionable" and that they had no "factual basis" but were instead "over-top-insults not driven by first-hand knowledge."